The Bed Bug Kit #2 provides you with the professional products necessary to do a complete bed bug treatment in your home or apartment. This kit has just the right balance of products to treat at least two rooms completely, plus enough to do the several follow-up treatments that are crucial to success. Unlike other kits you may find, the DoMyOwn bed bug & pest control kits contain the most effective products available based on the most current research. This kit contains 4 x 8mL of Temprid FX Insecticide, 1 x 4 oz. bottle of Cimexa Dust for Bed Bugs, 1 hand dusting tool, 2 x 17 oz. cans of Bedlam Bed Bug Spray, and 1 pint of Steri-Fab. Each kit also comes with our exclusive guide to help you through the treatment process. For residents of NY, RI, PR, or CT, see our New York Bed Bug Kit. It is important to treat the many different areas where bed bugs hide. Each product included in the kit has a specific function to help eliminate a bedbug infestation. We do not recommend relying on one product or treatment method since bugs may avoid areas treated with certain products, or they may become resistant to certain chemicals. It is also crucial to thoroughly Inspect the treatment area for possible bed bug harborages and to follow all the Treatment steps, including follow-up treatments. *Fill the tank 1/3 - 1/2 with clean, temperate water. Shake Temprid FX before opening, then add the appropriate amount of Temprid FX Insecticide Concentrate per gallon of water to sprayer tank. Use 2 x 8mL dose (1 bottle) per gallon of water for your first treatment; use 1 x 8mL dose (1 bottle) per gallon of water for follow-up treatments. *Allow the Temprid FX application to dry before applying Bedlam Aerosol. *Bedlam is a ready-to-use aerosol ideal for treating many areas, especially those where it may be difficult to treat with a pump sprayer. *Using the straw applicator will help to treat the tight areas where bed bugs like to hide the most. If you have trouble inserting the straw, try using a pair of pliers to force the tube into the spray nozzle. *Shake the can well before using. Bedlam is a water-based insecticide, but it will settle between uses. Upholstered furniture - Treat along seams and folds, under cushions, around legs, and on the undersides. Baseboards - Treat any cracks in the baseboard and then treat underneath the baseboard to prevent bed bugs from crawling underneath and accessing adjacent rooms in the house. Treat the whole bed - Mattress, box spring and bed frame – Treat along the corners, folds and seams of the mattress. Treat the undersides, corners, seams and under stapled dust cover and even the internal areas of box springs. Also spray the cracks, crevices, voids and screw holes of the bed frame. Pictures and wall hangings – remove from the wall and treat cracks and crevices of picture frames and behind pictures and wall hangings. *It is not necessary to broadcast Bedlam Aerosol in areas where you have just applied the Temprid FX. It is better to use the crack and crevice straw in areas near where you have applied the Temprid FX so that you may better treat the tiny areas where bed bugs hide. *Bedlam Aerosol will kill both the bed bugs that are contacted with the direct spray and those that come across treated areas for up to two weeks. Drawers and furniture - Remove drawers and treat along tracks and support, as well as the corners and edges of the drawers. Also treat in any hollow areas such as bed frame tubing. *Sterifab does not require dilution, but you should shake the container well before spraying. *Sterifab will kill bed bugs and other insects on contact only, so it is only active when it is wet. *Because of this short action, you can apply Sterifab almost anywhere bed bugs are found. *Sterifab will stay active as an insecticide, virucide, fungicide, bactericide, mildewcide, germicide, etc. as long as it is wet. Sterifab leaves no residual after it has dried. *Do not apply to clothing items or directly to people or animals. *Use as needed to spot treat live insects. STEP 6 - REPEAT! REPEAT! REPEAT! *Repeat Steps 1 and 2 (Temprid FX every 21 days and Bedlam every 7-10 days) until no one is getting bitten and there is no further evidence such as live bugs, cast skins or fresh blood spots found. This is absolutely crucial! Depending on the severity of the infestation it can take a minimum of 7-8 weeks, including repeat treatments. Failure to be thorough can prolong the bed bug control process and can make it harder to eliminate them. *Use Sterifab as frequently as needed to kill live bugs on contact. We were dealing with bites for most of the summer, but even several visits to the doctor didn't clear things up. When I discovered a bed bug crawling across my lap one night, well...I wanted to move. I was beyond skeeved out. Let me give you an idea of my situation: single mom of 3, disabled due to a serious back injury, a few other obnoxious health issues that cause severe fatigue, 4 dogs, 2 cats, and I homeschool my 12 year old daughter. We live in a townhouse that has 4 units in a building - so my townhome connects to two other homes. I spent a week or so doing intensive research...and I was overwhelmed before I even got going. I compared prices, product information, and online reviews. DoMyOwnPestControl.com shipped VERY quickly. I was grateful for the quick shipping as I didn't want to spend one extra minute with these nasty beasties crawling around. One thing that sold me on buying here, rather than some other company offering an almost identical kit, was the informational PDF they offer on the site. I loved having someone experienced in this stuff give me a little of their advice. (A national pest control company wanted $850 PER VISIT - for THREE visits - to get rid of these things. I just couldn't afford that.) They also include this helpful information in each kit they send out. Take advantage of that. Spend a few minutes reading it online, then refresh the info when it arrives. I promise it will make a big difference in making your job a lot easier! I was absolutely shocked where I found bed bugs. I was deeply disappointed when the "home remedies" I found online just didn't work. (It WILL kill them to put them in a SEALED Ziploc bag and then put the bag in the freezer for several days. All of the live bugs I find go into a Ziploc bag. It's quick and easy - plus you can look at them closely, if interested. They are kind of cool...*when stuck behind the barrier of a sealed Ziploc bag*!) Spraying an infestation (or harborage) of bugs with alcohol does NOT work. I don't care if you use 70% or 90% isopropyl alcohol or the green alcohol. Alcohol does NOT work. It stuns them for a few minutes, long enough to stick them in a sealed bag - but trust me. They come back to life. Quickly. I feel this kit covers all your bases. After THOROUGHLY vacuuming each part of the bed (box springs and mattress), I sprayed all the surfaces of each bed. (I also steamed the beds with a steamer I bought for this purpose.) When it was all dry, into encasements went the matresses and box springs. I then thoroughly vacuumed the carpet all around the bed, including using the crevice attachment to really clean around the baseboards. I sprayed, sprinkled, and squeezed the various sprays and powders, as instructed. I purchased the Chapin 1 Gallon Pump Sprayer separately and used that to apply the FenvaStar EcoCap. I was conscientious about applying stuff everywhere - I took drawers out of dressers and thoroughly treated everything. I used a cheap 1" paintbrush to help spread the CimeXa Insecticide Dust - which helped get the dust in all the cracks and crevices. The bellows was helpful to get the CimeXa into light switches and wall sockets. (Be VERY careful when using this bellows to administer insecticide in light switches, etc - just sticking something metal into a junction box full of metal wires and parts is NOT smart.) My townhouse is about 1800 sq ft at this kit seems like it will be enough to treat the house 3 times, as instructed. It's a huge pain in the neck. HUGE. To cut down on the amount of work, I did throw some things away - books and other things that were impossible to clean. I also got rid of a lot of stuffed animals my kids had. Yes, they can go in the dryer to get rid of the nasty beasts - but I was already tasked with rewashing ALL our clothes anyway...I wasn't interested in treating old toys and things the kids didn't care about anyway. And as much as I love my books, I love living in a bed bug free space more! Bottom line: I would DEFINITELY purchase this kit again. I think this size kit is good to treat approx 1800 sq ft 3 times. None of the products give off a terrible smell. The combination of items stop the bed bugs in their tracks. I still recommend placing any live bugs you find in a SEALED Ziploc bag - you don't want them crawling out of the trash and attacking you again...or worse, having eggs! Make sure you empty you vacuum bag or cup as soon as you're done vacuuming - I placed the contents into a small trash bag which I then sealed with tape. These guys are tricky and crafty - they will survive almost anything. This complete kit however, will give you the upper hand. Since bed bugs don't eat anything but blood (preferably human), regular pesticides will not kill them. They won't eat it. It must be something they come into contact with (or walk through) so it can dehydrate them and cause their demise. Just keep at it - you CAN win. Oh - and if you have questions, call DoMyOwnPestControl.com - they are extremely helpful and nice. If you have to deal with bed bugs, this is the place and kit to do it with. I'm very satisfied. PS: I added all the additional information because I wish someone had shared it with me while I was trying to research this issue. I apologize if that makes the review hard to read. In case it wasn't clear, I give DoMyOwnPestControl.com an A, as well as their Bed Bug Kit #2. This set of products is the same stuff that professionals use!!! I had a pest control company charge me $450 to treat my upstairs for Bed Bugs. They did a great job and I've had no further problems. After they left I searched the chemicals they used and discovered DoMyOwnPestControl.com and the Bed Bug Kit#2. I looked at the description on my receipt from the Pest Control Company and they used the exact same stuff in Bed Bug Kit to treat my upstairs. I felt so relieved to have found this bundled product and purchased it in case I have another infestation. It feels great to have the ability to kill BedBugs if they come back. I also purchased Mattress and Box Spring Covers, Phantom Aerosol Spray and Diatomaceous Earth. The pest Control Company also used the Phantom Spray. I slept on a couch downstairs after I threw out my bed. I thought I saw a bed bug on it and it was nice to have the products to treat it. Now I am fully armed if another infestation happens. My order was quickly processed and I received it in three days. I could not be happier with DoMyOwnPestControl.com. They were a beacon of light during a dark time of despair. If you are suffering a BedBug infestation you are not helpless, buy the products and get your life back. Easy to use. It's been over two weeks and no more bites. Plus I still have plenty for touch ups. FYI...I had a serious Bed Bug problem. I'm very pleased with the performance of the bed bug treatment kits. I thoroughly treated my home per product directions when I received the products (6 days ago) and have not had any additional bites after treatment. I have started using this product and so far, it is wonderful. It beats paying $1000 to a pest control and they do the same thing we did( but we did it better) taking our time....Thanks so much for sending this. I'm glad that we chose to do it ourselves first! For a case of bed bugs, how often should I spray? I live in an apartment. I just found out about a month ago it has bed bugs. My guess is they are in the 12 apartments. I lived here a year then I started getting bites. Management says we will be having a new pest control company in 30 days or less. I am on my own until then. Your best option is to use one of our Bed Bug Kits. They have a very high success rate and have all of the same professional products that most companies use for less than half the cost. Our kits also come with complete instructions that explain how and where to apply each product. You should treat every two weeks until activity is gone. Will Raid Ant and Roach Killer kill bed bugs? We do not carry any Raid products so we are not able to comment on what they will kill. We can tell you for bed bugs we recommend using a bedbug kit. The Bed Bug Kit #2 provides you with the professional products necessary to do a complete bed bug treatment in your home. This kit has just the right balance of products to treat at least two rooms completely, plus enough to do the several follow-up treatments that are crucial to success. 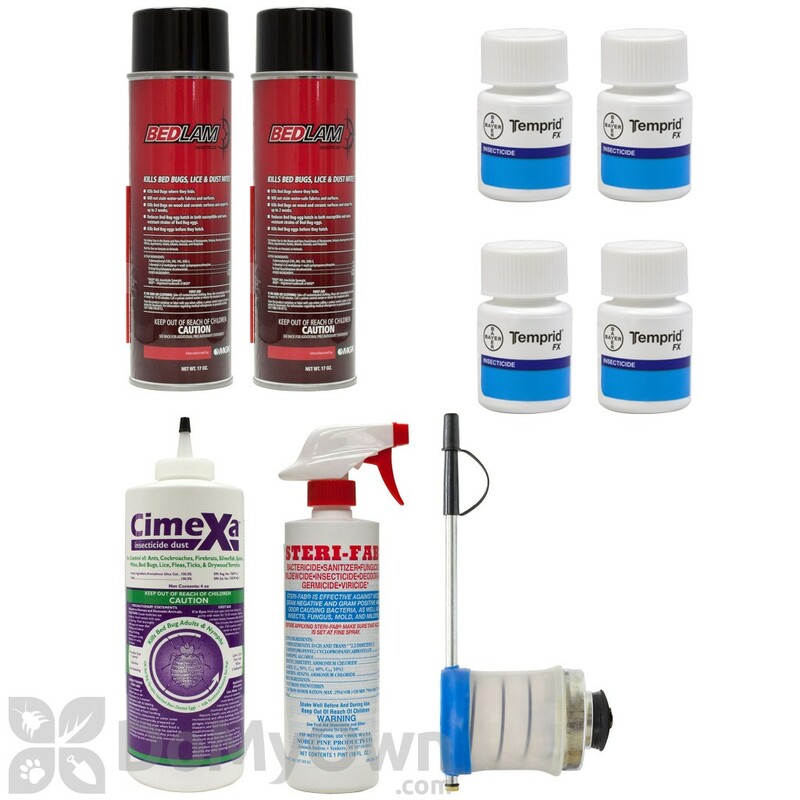 Unlike other kits you may find, the Do My Own Pest Control kits contain the most effective products available based on the most current research. This kit contains 1 x 8 oz. bottle of FenvaStar EcoCap concentrate (makes 8-16 gallons), 1 x 4 oz. bottle of CimeXa Dust, 1 x Bellow Hand Duster dusting tool, 2 x 17 oz. cans of Bedlam Bed Bug Spray, and 1 pint of Steri-Fab. It is very important that you take the time to educate yourself on all of the places bedbugs can hide and all of the labor that is involved in preparing a room for a bedbug treatment. Please take a few moments to read over our Bedbug Guide to get a general idea of what needs to be done. We also recommend that you encase all of your mattresses and boxsprings with Protecta Bed Encasements as mattresses and boxsprings can be very difficult to impossible to treat because of all of the seams, folds, cracks and crevices. I need to buy bed bug products but want it shipped in nondescript package. Is that possible? I don't want it know I am purchasing something for bed bugs. I need a package that says nothing on it but my name and a return address of your company but nothing about bugs! Our packaging is plain brown boxes or priority mail boxes. The return shipping label usually does say our name, but upon customer request it will just say Shipping, Shipping. Please let us know if you would like help placing an order. Hi, I'm looking for an end to end solution for bedbugs in my flat "1 bedroom + 1 living room". I don't have any heavy furniture like couch or bed however, there is a floor to floor carpet. Please let me know the order of application of the products in this kit (which product to apply first and which one next) and the number of kits that will be required to remove the infestation from my flat completely. I'm seeing 1-2 bed bugs in 2-3 days. One Bedbug Kit #2 should be enough product to treat 2 average sized rooms with a moderate amount of belongings. Very large rooms or those rooms that have lots of furniture or items that need to be treated may require additional products. Please take a few moments to read over our Bed Bug Guide which is included with ever bedbug kit purchase. This guide will explain how and when to treat and it will also highlight 'hot spot' areas that may need extra attention. We recommend that you treat every 7-10 days with the sprays (the dust only needs to be applied every 6 months unless it is displaced). The order that you apply the products is completely up to you. There is no magic number of products or treatments that will eliminate bed bugs completely. The key to eliminating the infestation is to be super through. Once you are able to go 30 days with no bites and no evidence of bed bugs on visual inspections, you are considered bedbug free. I got a few bedbug bites and applied Phantom liquid everywhere. Now what should I do? It is a week later. Is it safe or wise to apply Bedlam or other liquids before dusting, etc.? We do not recommend spraying Bedlam over areas where you have already applied Phantom. If you apply a repellent insecticide, such as Bedlam, over the same area where you have sprayed Phantom you will ruin the non-repellent properties of Phantom. The idea behind using Phantom is that the bedbugs will not be able to detect where you have applied the product. They will not be able to avoid the treated area and there is no known bedbug resistance to the active ingredient in Phantom.